How is Usain Bolt celebrating his three latest gold medals? With a little soccer, of course. 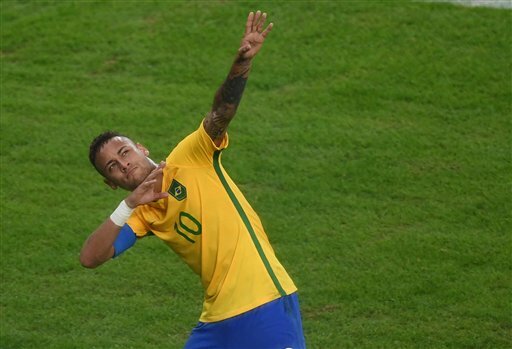 How is Neymar celebrating his goal in the Olympic final? With an homage to Bolt. The World’s Fastest Man was in the stands at Rio’s iconic Maracana Stadium on Saturday for the gold-medal match between Brazil and Germany. Neymar scored the match’s opening goal and afterward struck Bolt’s famous celebratory pose. Bolt, a big soccer fan who has often said he’d love to play for Manchester United, is also an admirer of the Brazilian star. Neymar, by the way, is pretty fast, too. He scored in 15 seconds into Brazil’s semifinal match against Honduras for the fastest goal in Olympic history. #Rio2016 ¿De @neymarjr para @usainbolt?